The Pittsburgh Penguins we know and love today are a team built on skill and speed. This new identity has paid dividends. While skill and speed are the basis of the game in the "new" NHL, having players that will get down and dirty when needed is also a valuable asset to any team. Grit is somewhat of a double edged sword. It can keep a team in the game and energize a hum-drum bench. Too much grit can also lead to a teams undoing (see WCOH Team USA for the prime example). It takes the right balance of skill, speed and hard-nosed strength to make a team successful. The Penguins have always had at least one grit player on their roster. At times they would have as many as three or four. Each man knew his role and wanted nothing more than to give their all in hopes to seeing his team raise the Cup. While the list could be as deep as 20-25 players (and even more if you go into the entire 50 year history of the team), here are some of the most notable and memorable "grit-style" players that have worn a Penguins sweater over the past 17 years*. I am going to start with the obvious. When thinking of a player with pure grit, Gary Roberts is one of the first names that comes to mind. He was not the flashiest or fastest of players but he held his own scoring wise. If he couldn't hit the net then he would make his mark in a different way...literally. Roberts could always be counted upon for that BOOM-ing hit that made your bones hurt by just watching it. Signs sporting "What Would Gary Roberts Do?" filled the arena game after game and his brutal checking style (along with a hot temper) earned him the nickname "Scary Gary". Defensemen have a certain way about them. The best ones have a certain swagger that will let an opposing player know that they have no problem getting the job done by any means necessary. Orpik is one of those players: A strong body with eyes that bulged out of his head when the game got intense He started having a knack for taking a run at players in the neutral zone which meant time in the sin bin. 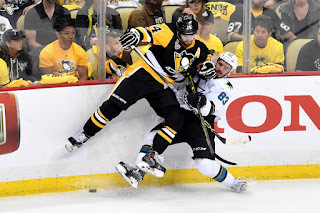 While most of the Penguins' fan base has not forgiven Brooks Orpik for the hit he laid on Olli Maatta during the 2016 playoffs, it must be remembered how much of an integral part of the Penguins defensive core he was in the 2008-09 season and their Stanley Cup win the same season. One of the ways grit is described is "one possessing a warrior spirit". One could look no further than current Penguin, Patric Hornqvist. Not only does the man live in front of the net, his intensity is contagious. He checks, he chirps, and he scores. If a scrum develops in front of the net, you can almost guarantee Hornqvist is involved somehow. He will sacrifice his body if it means getting or blocking a goal. The man has continued playing in games after taking pucks to the head, face, ankles, and knees. If that's not grit I don't know what is. Who could ever forget Max Talbot? The man was an agitating machine. His favorite target...the Philadelphia Flyers. Now playing in Russia, Talbot is a gritty grinder in every sense of the word. He could give a hit and take a hit within seconds of each other then come back for more. He played the same on home ice as he did on the road: hard. His legacy in Pittsburgh is cemented not only for his infamous "SHHHHHHH" (see video below) but for being the hero of the Stanley Cup Finals in 2009. Another characteristic of a gritty player is fearlessness. No fear in taking a hit. No fear in throwing a hard hip check. No fear in blocking 90 mile an hour slap shots. The current king of "no fear" is Ian Cole. He currently has 126 blocked shots in the 2016-2017 season. 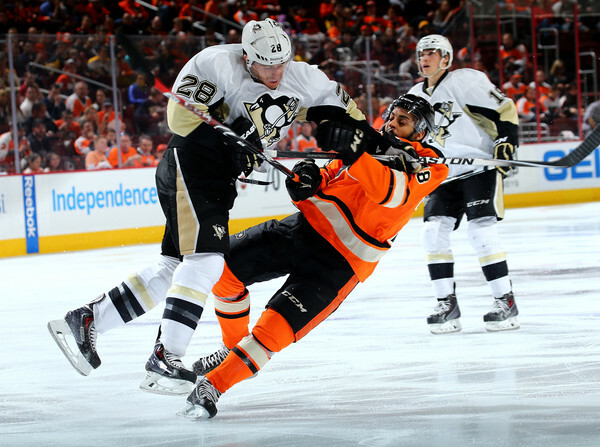 Last season he tied for the team lead, along with fellow defenseman Kris Letang, with 122. When asked on February 10 if he enjoyed blocking shots, his answer was "yes!" Cole is also a scrapper and will drop the gloves if the situation deems necessary. He isn't in the movie "Goon" for nothing. I would go out on a limb as to say Laraque was one of the last of the true enforcers left in the NHL before the winds of change blew in. Over his 695 career games, he would amass 1126 penalty minutes. Most of those minutes came from his 142 fights over his 11 years in the NHL. While he only spent two seasons as a Penguin, his star protection was needed during a time when Sid was still just a kid. As much as Patric Hornqvist lives in front of the net, so to does Chris Kunitz live along the boards. Many a player will battle in the high contact areas but it seems to be a siren call for the seasoned veteran. Kunitz had a balance of fearlessness and ferociousness that never seems to change no matter where in the line up he is. He can screen a goalie and reek havoc in the goal crease while taking hits and digging for the puck all at the same time. Kunitz is a solid player and though possibly at the end of his career, has been an asset to the Penguins since his arrival. Another rugged defenseman for the list is Hall Gill. His long arms were an asset for getting into another players space to break up a play without actually using his body. Those arms also loved taking advantage of a time where you could basically toss opponents away from the net. When he did play the body, he utilized a hip check that was like (brutal) poetry in motion. His style of play helped carry the load in 2008-09 and earned him a Stanley Cup Championship ring. From the late 90s to the early years of the 2000s, the name that everyone loved to hate was Darius Kasparaitis. In his six seasons with the Penguins Kasparaitis amassed 577 penalty minutes. He possessed the ability to knock the opposition into next week with a solid body check. As a defenseman, he wasn't big in the goal totals but he made up for it in hits. He lives on in hockey history as one of the most punishing players in the NHL (and Pittsburgh loved him for it). I could go on and on with this list. Names like Jarko Ruutu, Craig Adams, Billy Guerin and more could all be added if given the time and space. If I would add in pre-2000 the list could easily go to 50-100. These topics are fun to talk about and helps fans young and old bond over their favourite team and discuss/ debate who belongs where. Hope you enjoyed and feel free to chime in with who you would put in your own Nasty Nine list. (*players at listed at random and are not ordered in regard to importance, skill, or personal opinion. This is not a TOP list, just SOME of the notable names).